Please visit our website: Web Portals for Office 365 Wordpress, Drupal! Office 365 will be deprecating the SharePoint public facing website option, so we thought WordPress would be a great fit as a public facing website option, having a large community of developers and end-users, numerous themes and plugins. Unfortunately, there was no solution that integrated both systems together. We saw this as an opportunity. The large Wordpress community, and all the other third-party systems (salesforce, odoo, google apps etc) that it is connected with, but nothing was available for office 365. With our knowledge of both systems' APIs WordPress and office 365 (SharePoint, outlook, and Azure) we thought it would be a great match. Office 365 has several native mobile applications for Android, IOS and windows that can be leveraged out of the box. These include outlook, SharePoint, yammer, powerbi, powerapps, dynamics crm and skype. A suite of plugins connecting WordPress to Office 365 services(azure, outlook contacts, outlook calendar, sharepoint, skype). Having WordPress with its ease of use and many beautiful themes serve as your main public facing website or campaign website, meanwhile office 365 with includes SharePoint list support which comes with enterprise workflow and line of business application development possibilities. Intranets and extranets portal creation for staff, customers, and partner. Connect to office 365 data sources using this plugin. Additional plugin support form submission, SharePoint list sync, calendar sync, contact sync and Azure AD single sign-on. Mapping WordPress data with SharePoint List Items, Document Libraries and Calendar items. Synchronize WordPress data with outlook calendar events. 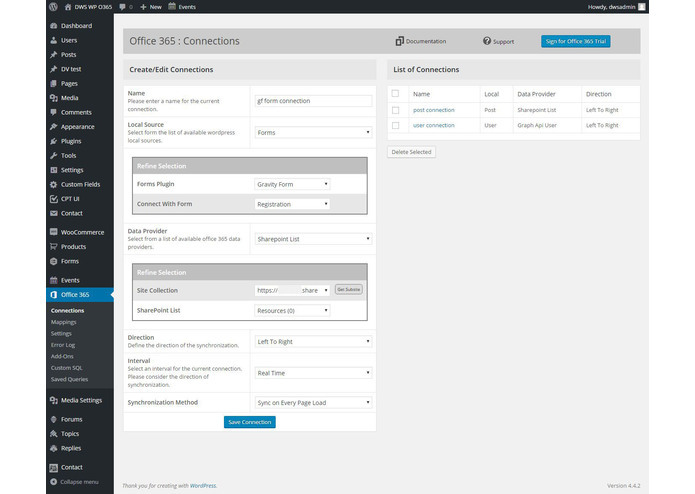 Synchronize WordPress data with outlook contacts. Synchronize WordPress data with Dynamic CRM entity types. Send submitted data from Contact form 7 and Gravity form to SharePoint list, Outlook Contacts and Dynamics CRM entities. Synchronize WordPress media files, any file system folders to OneDrive for Business. Create and register WpUsers to a specific Azure Active Directory(AAD) Group, these Wpusers will now have an account in AAD having possible access as external users to varying Office 365 services. Authenticates a WpUser against Azure Active directory(AAD) and logs that user into WordPress. Query your WordPress data using SQL and have that information mapped to a SharePoint List. Build integrated reports that mash up/data from a multiple organizational data source including Wordpress and woocommerce, to show an accurate picture of the organization’s performance in one dashboard.Embed varying reports or dashboards in the context of Wordpress and woocommerce. Build and integrate Powerapps based on Wordpress and woocommerce data, Embed Powerapps with complex business logic based on multi sources into Wordpress and Woocommerce. Build mobile applications that uses Wordpress as a database/data source. Enhance the experience of your user by offering an intuitive and robust mobile application. First class mobile application via Microsoft. This has built over a 7-8 month period, where it was a full time and dedicated effort. The system leverages a user's AAD tenant, where a web application is created and a client ID and client secret key are generated. 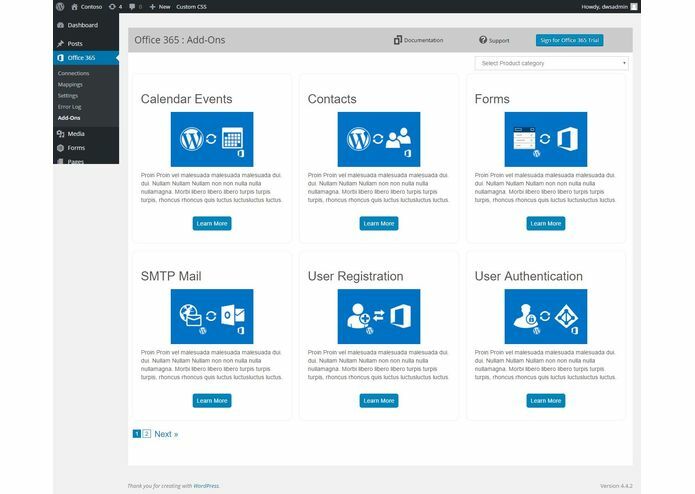 The office 365 APIs, azure users, outlook contacts, outlook calendar and SharePoint api's are leveraged by the WordPress plugin to synchronize and map WordPress user, post, form and custom sql query data into office 365. 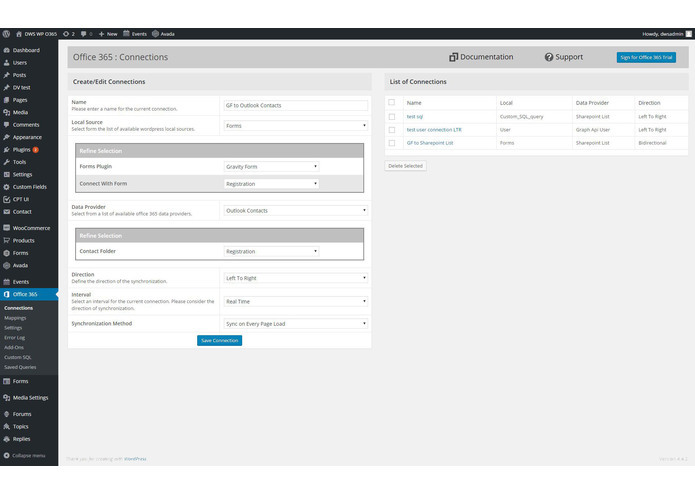 The synchronization options are bi-directional, WordPress to office365 and office 365 to WordPress. Synchronization can also be timed based on an internal 5 minutes, 1 hour etc. There was not a lot of sample code or direction as to connecting PHP/WordPress with the azure and office 365 APIs, so a lot of research and proof of concepts had to be done initially, which took some time. The final product looks and works great. The application is very robust and can be leveraged for every type of website large or small and any vertical or industry that wants to connect their WordPress website with office 365 services. More support for other offices 365 APIs. Add multi-lingual support. 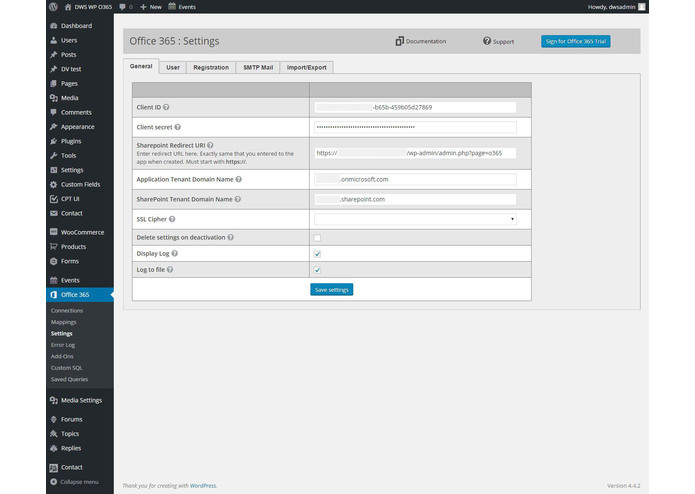 Suite of worpdress plugins that utilizes the office 365 apis.